Enter your email, and we will contact you shortly about your office needs. Read more about the project on our projectwebsite, globalbusinessgate.se/en. In an attractive central location on the banks of the river, Göta Älv, just a short walk from the Järntorget tramway hub and with excellent access for cars via the nearby Oskarsleden dual carriageway, Elof Hansson Properties in collaboration with Alecta, creates a cluster for international trade operations – Global Business Gate. By gathering together expertise and promoting interaction and valuable exchange of ideas, Global Business Gate will support increased dynamics and growth in the Gothenburg region. Global Business Gate will be a cross-border, innovative hub, a forum for commercial operations. The focus will be on companies involved in trade and business but there will also be room for academia. There are many good examples of the benefits of a cluster formation. It boosts company competitiveness and helps with complex business dealings thanks to immediate access to expertise and consultants. The dynamics in a cluster also enhance the individual’s career opportunities and improves the company’s recruitment processes. The aim is that Global Business Gate should also help strengthen the appeal of the Gothenburg region. Its central location with direct links to the downtown area means that the heart of the city also benefits. Our intention is that first tenants moving in to Global Business Gate in 2023, and that the project will be a contribution to the 400th jubilee of the city of Gothenburg. Trade has immense importance for Gothenburg and Western Sweden. Gothenburg has excellent preconditions thanks to its geographic location and its proximity to two universities of renowned international acclaim. Global Business Gate initiative aims to further boost Gothenburg’s position as an international trade and commerce centre. Global Business Gate will be characterised by a modern, sustainable environment that offers shared meeting-rooms and space for the development and exchange of inspiration. Its appealing working environment will attract future talent, both from Sweden and the overseas market. 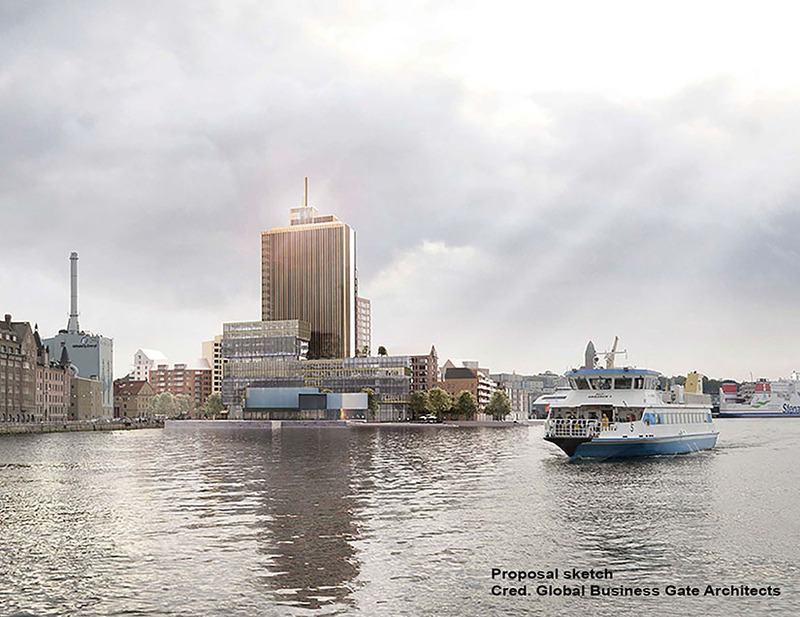 Global Business Gate will also give the city of Gothenburg a new landmark building. The mix of business premises and apartments will create a dynamic and vibrant atmosphere, one that encourages innovation and competence enhancement. Located beside the river, in the very heart of Gothenburg, Global Business Gate will become Sweden’s and Scandinavia’s foremost commercial gateway. Read more about our concept at globalbusinessgate.se.